In our Trauma Kennels today, like always, some good stories and some not so. Link (top left): Link’s tail was completely ripped off, our vet tried her best to even sew it back on, however, it had lost vitality. He is slowly recovering now. 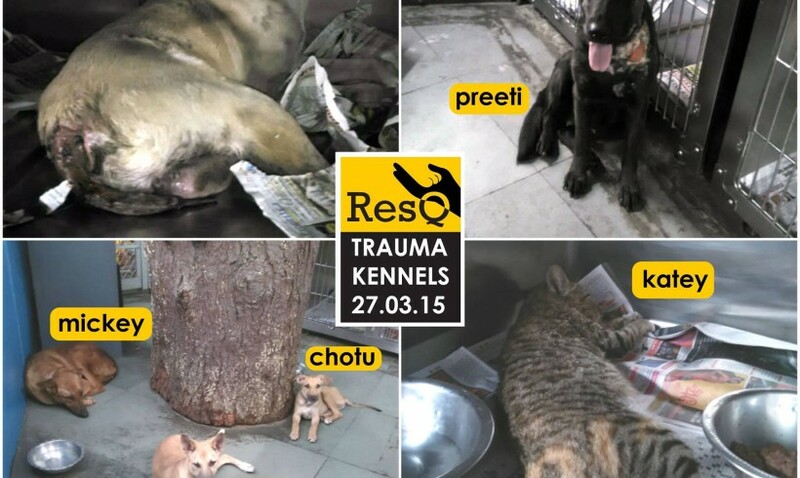 Preeti (top right): Had a very deep maggotted wound, she is recovering very well. Katey(bottom right): Accident case, paralysed for now. We fear she may even be pregnant so we’re being extremely about her medication. This one needs all your prayers. Mickey (bottom left): recovered wounds and transformed personality…he is ready for release! Pillu & Chotu (bottom left): both fracture cases..now fit and ready to release! *chotu is looking to adopt a human…does anyone feel like being saved? :)* If yes, call us on 9373888500!